Throwing a large party can be a huge undertaking. Find out to do it the right way without getting totally overwhelmed. 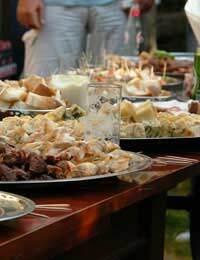 Your budget will largely determine where you hold your party whether you will be serving substantial food items and whether you expect your guests to help out in the alcohol department. Do this monetary assessment right at the start of the party planning process. The last thing you want is to realise halfway through that you cannot afford to even think about holding a party this large! Do not under-estimate costs. Food, drink, decorations and even the cost of clean up after the big night should be factored in. There are many places to host parties although the most common tends to be where the host actually lives. If you are thinking of inviting 100 guests you will have to be able to accommodate that number. Note that 100 people will increase the chances of breakage of your most precious possessions, dirty carpets and spilled drinks. Think. Do you really want this to happen in your own home? If the answer is no, you must think about hiring an external venue. Visit the alternative venues early on in the planning process. Hotels, bars, restaurants and local halls are all viable locations but they often come with a price tag. The benefit of choosing this route is that staff are often included in the price and that makes things easier for the host so weigh up the pros against the cons of cost. As with any party, your potential guests need time to plan so be sure to book them in advance! This is especially true at festive times of year like New Year’s Eve, Christmas and Halloween. One way to invite a large amount of people is to send out a mass email. It’s the easiest and cheapest way of undertaking a huge task. It also makes it easy for people to RSVP and when you are planning a party on a large scale you need to know that there are going to be enough attendees. When you have 100 guests you need to ensure that you are adequately stocked, not only in the drinks department but also in terms of food. You don’t need to provide a three-course spread – this will really blow a budget – but some canapés are definitely in order! If it melts or goes limp in a warm room then think twice about serving it. You should also remember that at large parties, people don’t move around a lot. If it’s crowded they won’t be able to move so it’s important not to feed them items that require disposal of the remains. Only the very good and careful guests will make the effort to throw rubbish away in a bin - the rest will simply drop it on the floor. Items like crisps and nuts will keep your snackers happy. A point to make is that these kinds of snacks are laden with salt and may make your guests even thirstier – enough drink is therefore essential! Also think of laying on warm food like chips, melted goats cheese on roasted vegetables and fishcakes. A vegetable platter, loaded with carrots, cucumber, celery and cauliflower pieces will appeal to the more health-conscious of guests. If you are playing the gracious host and bringing people together, you should really cater for your guests in the drinks department. 100 drinking guests may mean a huge drinks bill. If you are hosting the event at an external venue you can cut the cost by having a free bar for the first hour or so of the party and then making your guests pay for their own drinks after that. That may still eat into your budget, especially considering the costs of staffing the bar. Factor this into your overall cost. There is nothing wrong with stipulating BYOB on your invitation. Many of your more polite guests will no doubt turn up with a bottle in hand anyway. Provide a large drinks table and plenty of plastic cups so that your guests can help themselves and you can dispense with hiring staff for the night. Ice is a valuable commodity at a large party. Keep drinks stored in bathtubs full of the stuff! Think about getting an ice luge – a large slice of ice that has a path or two carved into it. Pour shots into the top and your guests can put their cups at the bottom to receive an ice cold drink! This is a real talking point and a good way to ensure cold drinks are being served. A couple of cheap electric fans – large parties can get very hot! On the day itself there is still a lot of work to do. The first thing to do before a large party is to turn the heating down. All those bodies are going to radiate heat and rather than making your guests want to leave early, simply turn down the thermostat.Remove the fragile ornaments from the rooms where the party is going to be happening and lock them away. These people may well be your friends but accidents do happen. Re-arrange the furniture. Move chairs and bulky pieces of furniture away to free up as much space as possible. Delicate tables that might be mistaken for chairs by drunken guests should be confined to that locked room – you don’t want any family heirlooms coming to a fragile end tonight! Get the music ready. If you have hired a DJ, brief him or her on what kind of music you want to be played. If you are relying on your CD collection to deliver the goods remember that there a various stages at a large party – you’ll need to prepare music for when the party is getting started and moves into high gear, but also for when the party is coming to a natural end. Get your friends to help burn some good CD’s for the night. Throwing a large party is a real test of your organizational skills. Be sure you're ready for it! Prep your party checklist, bring a camera and have fun - this is your night so enjoy it!